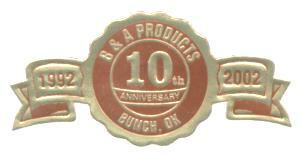 B&A Products, Ltd. Co. is owned by Byron and Annie Kirkwood. B&A was founded in 1992 in the Dallas area to provide support for Annie's books and Byron's products for emergency preparedness. The Kirkwood's and B&A moved to Northeastern Oklahoma in 1995. This beautiful area is known locally as Green Country and is in the foothills of the Ozark Mountains. The web page is divided in two sections. Byron operates B&A Products, Ltd. Co., an emergency preparedness distributor, and Annie writes spiritual and inspirational books and publishes a bi-monthly newsletter. information about Annie Annie's web page includes the bi-monthly newsletter, Mary's Message/Newsletter, information about her books, and much more.